Fire up this app, and you can find a car nearby, and drop it off anywhere you please. Zipcar users know that the main irritant is having to schlep to the nearest garage that houses the vehicles — and having to go all the way back when you’re done, which drastically limits how you can use the cars. (No commuting, and forgetting getting from A to B; instead, it’s A to B to A.) With DriveNow, you just pick your Beemer up off the street, and when you’re done, leave it wherever you happen to be — no “returning” necessary. 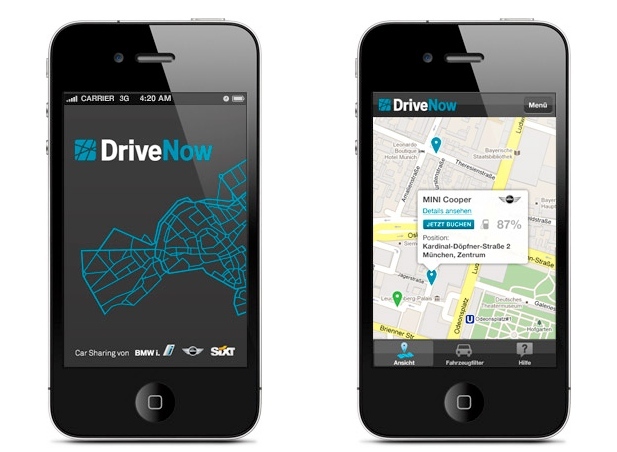 And, of course, you find your DriveNow car in the first place the same way you find everything these days: via a dedicated location-aware smartphone app. That way, wherever you are (in Munich, that is), you can fire up the DriveNow app and find the nearest “ultimate driving machine” to help you get your grocery shopping done or whatever. Thus, if you’re ever stuck in a situation where you unexpectedly need a car, you can get one. According to GOOD, the initial fleet of 300 cars should be enough to keep Munich residents motoring, at a better-than-taxi rate of 29 cents per minute. (Don’t forget: that includes parking. Sweet, sweet parking.) If this pilot program goes well, maybe BMW will port it over to the U.S. Hell, if I’m going to make a run to the Fairway Market (New Yorkers: you know what I’m talkin’ about), I might as well do it in a luxury car that I can dump anywhere on my block when I get home!